The modulation of catalytic activity in protein kinases is achieved by a diverse range of mechanisms. The structures of the active states of kinases that are constrained to be similar by the chemical requirements for catalysis of phosphate transfer. In contrast, the structures of inactive states of protein kinases show considerable diversity . In this review, we present examples of the inactivation mechanisms of two different tyrosine kinases for which structure determinations have been carried out in both the active and inactive states of the enzymes. 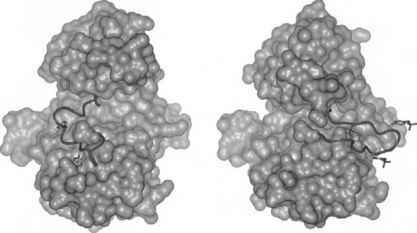 The first is the insulin receptor kinase (Irk), and the second is the Src family of tyrosine kinases. Figure 2 Active site of a crystal structure of PKA trapped in a transition state intermediate conformation bound to ADP-AlF3 and substrate peptide (PDB code 1L3R) . 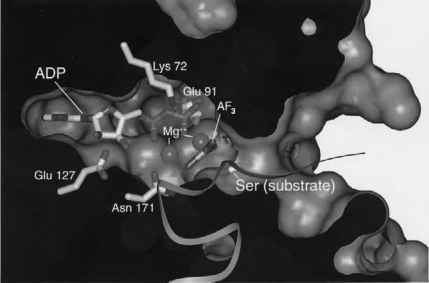 Charged sidechains that make key interactions with the ATP and Mg2+ ions are shown: Lys 72, Glu 91, Glu 127, Asn 171, and Asp 184. The serine acceptor on the peptide substrate is also indicated. Figure 3 Structures of the catalytically inactive (left) and active (right) forms of the kinase domain of Irk (PDB codes 1IRK and 1IR3, respectively) [15,16]. The active state is stabilized by the phosphorylation of three tyrosine residues in the activation loop. kinases have been solved in recent years (for reviews, see references  and ). Receptor tyrosine kinases contain a variety of extracellular ligand binding domains in the N-terminal extracellular region, followed by a short membrane-spanning region, and finally a catalytic tyrosine kinase domain in the C-terminal cytoplasmic portion of the proteins. Ligand-induced alterations in the oligomeric state of the receptor or in the conformation of oligomeric forms of the receptor can stimulate phosphorylation of the kinase domains, facilitating the propagation of a downstream cyto-plasmic signal . Structures of catalytically active and inactive states of the catalytic domain of insulin receptor kinase are shown in Fig. 3 [15,16]. Activation of this receptor involves the phos-phorylation of three tyrosine residues located in the activation loop. The effect of this chemical modification is to induce a major conformational change in the structure of the loop. In the inactive state, the activation loop is found in a relatively compact buried conformation that sterically blocks access to the protein active site and further attenuates catalytic activity by causing conformational changes within the catalytic center. The addition of three negatively charged phosphate groups to the tyrosine residues in the loop destabilizes the buried conformation of the activation loop and favors a more solvent exposed conformation that opens up the enzyme active site for the entry of a peptide substrate. The Src family kinases comprise a closely related family of nine distinct nonreceptor tyrosine kinases that function downstream of membrane-associated proteins in intercellular signaling pathways. Src kinases possess two peptide binding domains, the SH2 and SH3 domains, that are located upstream of the catalytic domain. In addition to having a single Tyr phosphorylation site (Tyr 416 in chicken c-Src numbering) in the activation segment that serves to activate the kinase when phosphorylated, Src family kinases also possess an important regulatory segment that is located immediately after the kinase domain (Fig. 4) . Figure 4 Crystal structure of inactive Hck (PDB code 1QCF) . The two peptide binding domains (SH3 and SH2) bind intramolecularly to form an assembled inactive conformation. Tyr 416 in the activation loop (red) is dephosphorylated. Tyr 527 in the C-terminal tail of the protein (red) is phosphorylated and bound to the SH2 domain (green). The crystal structures of inactive Src kinases have been determined [18,19]. The crystal structure of the catalytically inactive state of the Src family member Hck is shown in Fig. 4  (the structure of inactive c-Src is very similar ). The downregulated state of Src-family kinases is characterized by phosphorylation on Tyr 527 in the C-terminal tail, with Tyr 416 in the activation loop unphosphorylated. 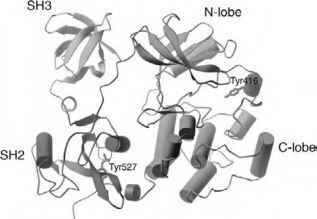 A distinguishing structural feature of these kinases is that upon inactivation these proteins adopt a closed and assembled state in which the SH2 domain binds intramolecularly to phosphorylated Tyr 527. The assembled state also finds the SH3 domain, located immediately upstream of the SH2 domain, bound intramolecularly to a type II polyproline helix that is part of the connector between the SH2 domain and the kinase domain. Displacement of either of these two intramolecular interactions via external ligands will stimulate activation of the kinase, demonstrating that these intermolecular docking domains function as protein localization handles as well as playing a role in the allosteric inactivation of the kinase. Members of the Src family of Tyr kinases share roughly 75% sequence identity with each other in the SH3, SH2, and catalytic domains. The structure of the activated state of the Src family member Lck can thus be contrasted with the structures of the inactive state of Hck and c-Src to highlight specific conformational changes that occur in this family of kinases upon inactivation. The two most dramatic changes include the closing down of the activation segment to steri-cally block the peptide-substrate binding cleft, and the nearly 45° rotation of a-helix C to bring a catalytically important Glu residue (Glu 310 in chicken c-Src) out of alignment such that it can no longer interact with a conserved lysine residue that coordinates ATP. While the former mechanism is similar to the inactivation mechanism found in both Irk and PKA, the specific misalignment of a-helix C is tightly coupled to the unique assembled closed state that the three domains Src family kinases adopt upon inactiva-tion and is an example of diversity found in the inactivation mechanism of distinct protein kinases.